1285077881 –NOTE: This book is a standalone book and will not include access code/card. Now in its 7th Edition, ESSENTIALS OF PHARMACOLOGY FOR HEALTH PROFESSIONS is the best-selling resource for those preparing for licensed practical nursing, medical assisting, and other allied health careers. Clear, concise writing focused on “need to know” drug information gives readers the confidence to master pharmacology. Learn calculations quickly through a simplified step-by-step process. Part I chapters center on basic pharmacologic principles. Medication preparation, supplies, and specific information on each route of administration is covered. Administration checklists allow the learner to put the knowledge into practice. . Part II chapters organize drugs by classifications, and includes purpose, side effects, cautions, interactions, and contraindications. Patient education is highlighted for each category. Reference tables with each classification list the most commonly prescribed drugs according to generic and trade names, with dosage and available forms. 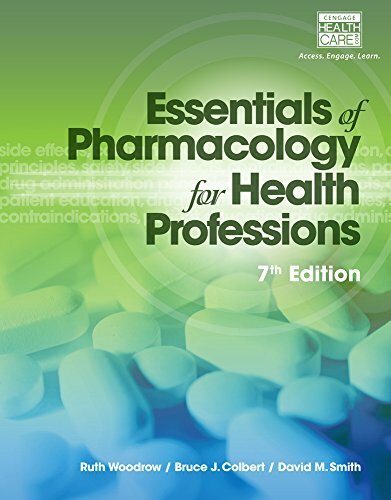 The complete pharmacology resource for allied health professionals at every experience level, ESSENTIALS OF PHARMACOLOGY FOR HEALTH PROFESSIONS, 7th Edition also makes a great refresher and on-the-job reference.